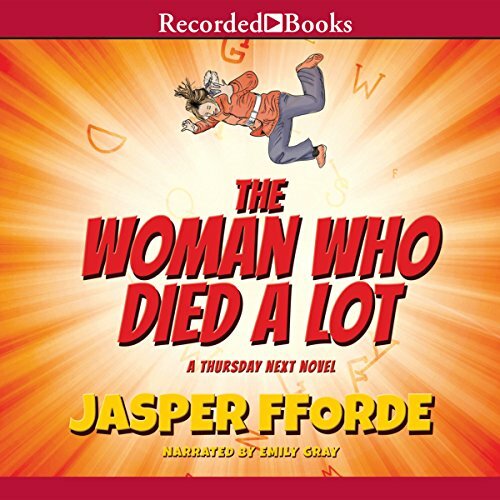 Jasper Fforde's delightfully zany Thursday Next series shows no signs of slowing down with its seventh entry, The Woman Who Died a Lot. Despite being semihappily semi-retired from SpecOps, Thursday accepts the head librarian position at the Swindon library. But soon threats from a supreme Deity, a mnemonomorph, and the nefarious Goliath corporation press Thursday back into active duty. I wish I could rate this at 4.5 stars. It falls a bit short of 5 stars, but deserves better than a 4 star rating. A must read for anyone following the series. But if you're following the series, you know you'll read this book eventually. While the book before this (One Of Our Thursdays Is Missing) occurs almost completely in the book world, this one occurs almost completely in the real Thursday's world. The story was interesting throughout, and narration was perfect. 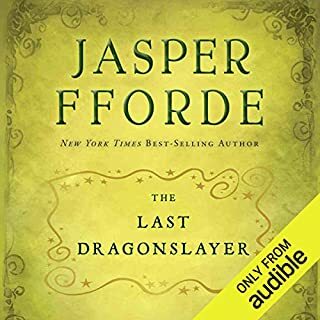 I don't usually listen to an audiobook again immediately after finishing it, but this one was interesting enough that I did so, and managed to pick up some nuances I missed the first time around. I would not recommend this book to anyone who hasn't read the Thursday Next series before, however. I started with one of the books in the middle and it took a while figuring out what was going on. Start with the first book for maximum enjoyment. 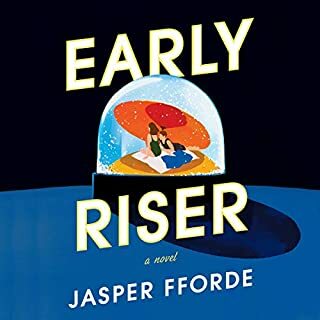 Jasper Fforde is back! Awesome! What did you love best about The Woman Who Died a Lot? 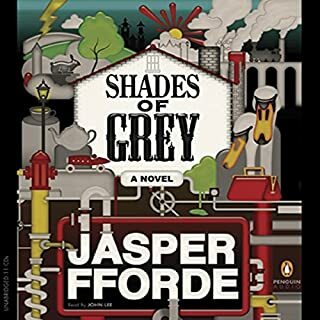 I've read all of the Thursday Next series, and I thought the last 2 or 3 books not as good as the first few, but with this edition I thought Jasper Fforde got his stride back. This story definitely had that extra spark that the last few books were lacking. The writing was spot-on and hilarious. This series is one where I frequently find myself laughing out loud, which is really embarrassing sometimes when I'm sitting in my cubicle at work and people start looking at me weird. I liked the new story with the Library Service and Fforde's explanation of that branch of the military(?). This whole alternate reality that Fforde has created with Thursday Next is continually expanding and this was particularily humorous in this book. Emily Gray does a very good job shifting through all the characters. She definitely is a great narrator with perfect comedic timing. Well, these stories bring more laughs than tears most of the time, but the bit about Jenny at the end was kind of saddening, but hopeful. I don't want to give to much away there. Definitely worth a listen for any Thursday Next fan! You'll be really happy you did. I'm already gearing up for the next edition. The Thursday Next series continues, as mind-boggling, entertaining and thought-provoking as always. Emily Gray's reading again makes the most outlandish situations seems perfectly reasonable. The humor is both timely and timeless. 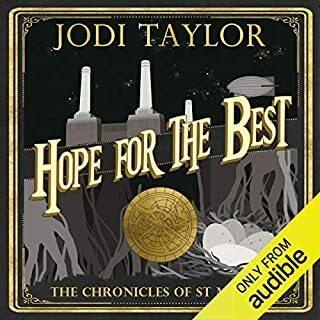 I loved reading the book and love the audio edition too; I have already listened to it a second time. 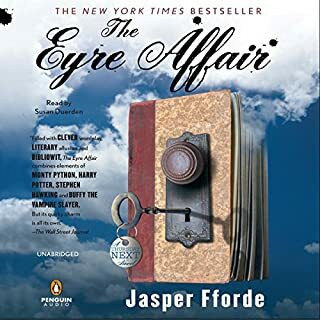 As usual with Fforde's fiction the prose is so full of jokes, puns and references that it is almost impossible to catch everything the first time, especially when the reader/listener gets caught up in the plot. Essential for fans of the series. Although I really miss the bookjumps into fiction, and meeting all the crazy characters from well-loved classical literature, Fforde still manages to entertain me with Thursday's adventures. If you're a fan, you'll enjoy this. NOT recommended if you haven't read the previous books. You simply won't understand what's going on. The good news is that this book sets us up for Fforde's next Next adventure - a jump into the dark reading material at the center of the universe. Can't wait! I would only recommend this book for those who are already dedicated to the series. It was more like catching up with old friends than anything else. Fforde did not let us into the book world this time, and that has always been one of my favorite parts, and Thursday was the only character who really did anything of interest. As always Emily Gray did a spectacular job on all the characters in this series. Most Definitely! Even though it is a weak offering in the series (not the weak-est), it would still make a terrifically fun movie! I love the character of Thursday Next. The supporting characters are great too. I loved the fabulous absurdity of the dialogue and the intricacy of the plot. Although I love the book world, this real world story captivated me. She is the perfect voice for Thursday. You'll wish everyday was Thursday. Great series. One of the wittiest and most original I have read. Highly recommend. As always, Thursday Next is a tough and tender character and the crowd of zanies around her bring humor and craziness to the world. It's best to listen to the series in order as there are many references to earlier books. 1. Start at the beginning with the Eyre Affair, or as early in the series as you can. The first book introduces a bizarre and amusing world and the following couple books add some wild dimensions. 2. Emily Gray sounds like she's middle aged or beyond and perhaps appropriate for Thursday's time of life in this book. Her words are clipped and quick but excellently enunciated and I have no real complaint. But Elizabeth Sastre did the earliest narrations and her voice is a real treasure. Her voice is richer, like Glenda (witch of the north in Wizard of Oz) but sexier. Definitely more pleasant to hear and more appropriate for a young Thursday. I got the earlier books on cassette or CD from the library and the first 3 for sure are narrated by her. I notice some of the same books are by Emily Gray on Audible: get the Elizabeth Sastre versions if you can. I get a great kick out of Jasper Fforde's quirky humor. When I want a pick-me-up I listen to the mp3 recording I made of the "had-had" discussion in "The Well of Lost Plots". Pure genius. And Jasper does not disappoint in the latest Thursday Next. Thursday doesn't get back to the Book World in this one, although the Book World plays prominently in the search for "Dark Reading Matter" (a literary analogy to the Dark Matter and Dark Energy that physicists theorize constitutes a lot of our universe). There's a good bit about time-travel, but not too much of paradoxes to make your head hurt. Lots of standard Thursday Next fare too, the Chronoguard, SpecOps, smitings and marmolite and whatnot. I had to pay close attention to the Park-Lane family's discussions of the daughter Jenny - a few times I backed up to re-listen to one section or another. Aornis Hades is back, not killed (as I thought) in "Lost in a Good Book". Emily Gray does her usual great rendition of the characters in Thursday Next's world. I've always thought that a lot of her male voices sounded pretty much the same, but that's just a minor quibble. If you're new to this series, I would recommend listening to them in order. 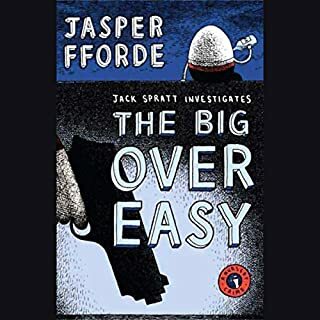 There's a fair amount of continuity between the books, and while Jasper Fforde does a pretty good job filling in the back-story, it will help a lot if you've already heard it. Lots of fun. You won't be disappointed. Would you listen to The Woman Who Died a Lot again? Why? Sure -- on a rainy day while knitting or doing a puzzle. Jenny -- who doesn't exist. But Fforde has done a great job here with Landon, formerly a stick character. Emily Gray IS Thursday Next. She makes Fforde's absurd and increasingly complex world plausible.